Hilkka Hiiop "Art Detectives. The Natural Sciences and Infotechnology in the Service of Art Research"
Learning-centered teaching approaches that can only be achieved through cooperation are a cornerstone of today's higher education. This conference is dedicated to the development of teaching and learning and deals with issues such as the essence of learning-centered teaching, new teaching tools that support and facilitate quality learning, differences in field-specific teaching, and the role of leadership in ensuring quality teaching and learning. The conference provides opportunities to present results of higher education research and the scholarship of teaching and learning, as well as to share best practice experiences with colleagues. Everyone interested in supporting the development of their students and enhancing their teaching in higher education is invited to participate. 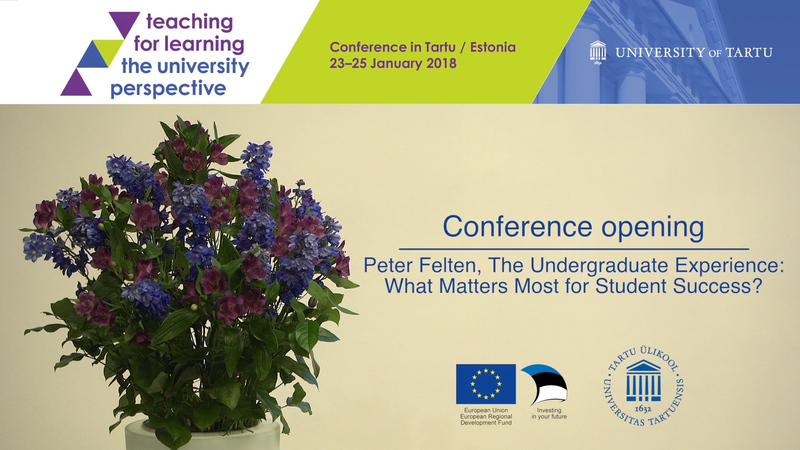 Peter Felten "The Undergraduate Experience: What Matters Most for Student Success?" Andy and Kathryn Penaluna "Future Proofing Education, the Entrepreneurial Imperative"
Erik de Graaff "Teaching Self-directed Learners"
Anneli Saro "Performative Power of Teaching"